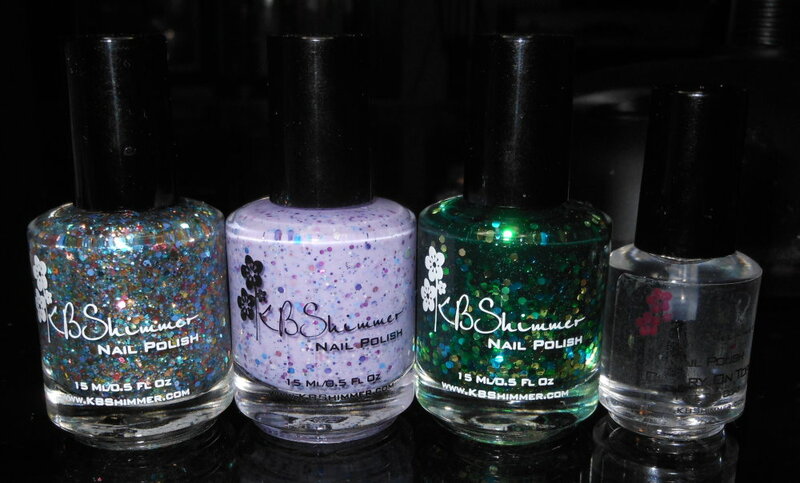 I have 3 polishes from KBShimmer's Spring 2013 collection (link is to press release) to share with you today! 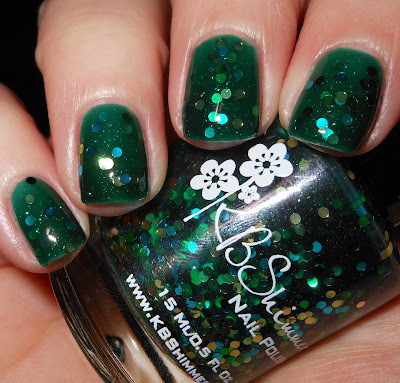 If you remember, KBShimmer was voted #1 by many of you as the best handmade indie polish brand of 2012 on my blog. KBShimmer was also my pick for this category too. I was excited to be able to review some of these polishes since I know how great they are! These colors are perfect for spring, but all have a punchy, bold, and fun twist! Pastel Me More is mixture of pastel colored glitter in varying sizes in a clear base. If you love rainbow glitters, you will definitely love this one. I love that this is pastel glitter! This glitter is perfect for spring and will be a great topper to your spring brights and pastel polishes. I used one thick coat on these polishes above. Pastel Me More applied well and evenly. Iris My Case is violet pastel "crelly" (cream jelly) base with purple, pink, silver, and blue glitters. 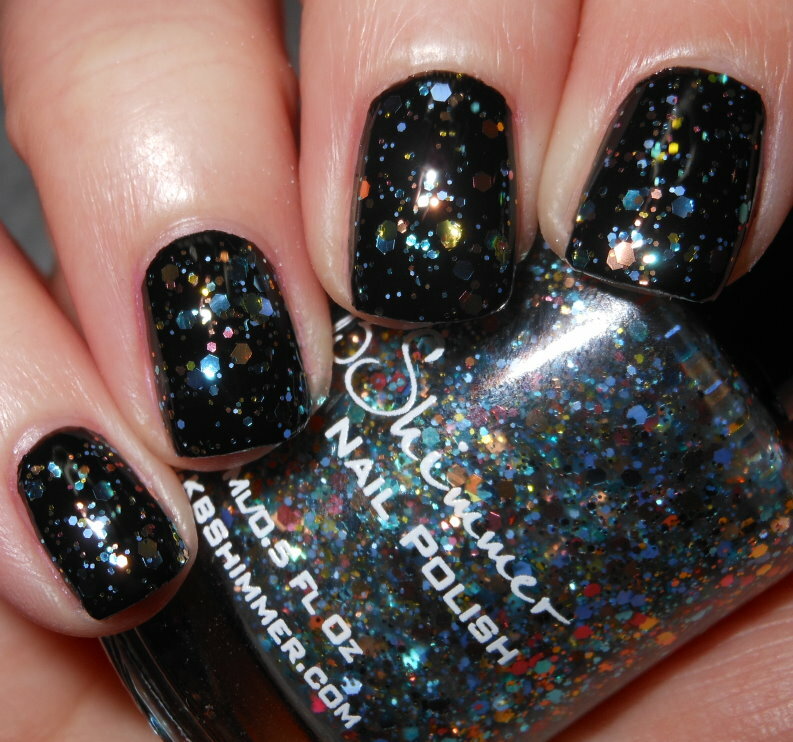 This is a beautiful polish. I'm a sucker for lavender in spring and this a gorgeous shade. The highlight of this polish is definitely that bright blue glitter! I love how it pops against the soft purple. I used 3 coats in this swatch, and this applied evenly and smoothly. I do not have very much luck with crellies as far as application, but this applied very easily. Get Clover It is a emerald green jelly with green, gold, turquoise circle glitters, and a micro shimmer. I've never seen anything like Get Clover It before. The green jelly base with this flashy and shimmery circle glitters make me think of a enchanted forest or lake. 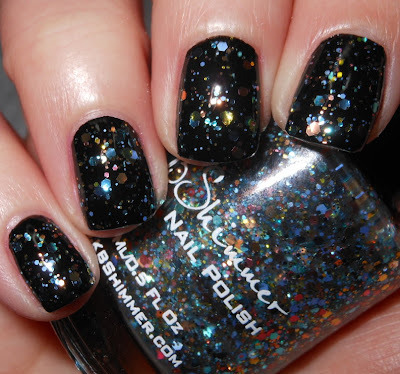 I know that sounds weird, but this polish is just so cool it reminds me of something magical. I love the circle glitter! This polish is awesome! I applied 2 coats over Cult Nails Nevermore in the top photo and used 3 coats on its own in the bottom photo. This one applied well too. The circle glitters you may need to work with a bit to get on your nail, but it wasn't anything unmanageable or tricky. Clearly On Top is a quick dry and 2 free top coat. I applied it on top of all the swatches above. This dried quickly, shiny, and smoothly on top of these great glitters! I'm very impressed with these polishes by KBShimmer. I love the variety of finishes, glitters, and colors in this collection. There is definitely something for everyone, and in my case I want it all! The application on these was consistently good too. I think you all will love this collection! Which is your favorite of this bunch? The KBShimmer Spring 2013 line will be available for purchase on their website on Friday, February 15th. You will also be able to purchase these on Harlow & Co.
You can currently purchase the Clearly On Top quick dry top coat for $5.00 (15ml) or $3.00 (7ml) on their website. Be sure follow KBShimmer on Facebook, Twitter, and Instagram! *These polishes were sent to me for my honest review by KBShimmer. I'm really excited for these polishes to be released. All three of these are gorgeous. I especially love Iris My Case, but Get Clover It is also stunning. I. Need. Get Clover It. STAT! I LOVE Get Clover it! Especially on it's own. Beautiful swatches! I have Pastel Me More on right now after a day of swatching, and I am loving it! I love how it looks over both of the shades you showed here! Auuuugh I love Pastel Me More. Probably looks great over white too! I really like Iris My Case. Iris My Case is so beautiful and the names in this collection are lovely! Great swatches, thanks! I'm not a fan of glitter polishes at all (I know, the horror) lol, but I do admire KBShimmers polishes ...they all look so beautiful, and these are equally beautiful. They all look great on you and I like the layering combos you chose. I'm not a glitter girl in the slightest, but Iris My Case is an absolute gem. Plus that lavender is just lovely on you!